For the first time since it entered the industry seven years ago, U.S.-based Micron Technology Inc. managed to cross the 20 percent market share threshold in the NAND flash memory business during the second quarter. Micron posted the strongest sequential performance of all NAND suppliers, with second-quarter revenue amounting to $897 million, up 6 percent from $846 million in the first quarter, according to an IHS iSuppli NAND Dynamics Brief from information and analytics provider IHS (NYSE: IHS). In comparison, the other ranked suppliers all suffered revenue declines during the same period. Despite overall NAND flash market revenue declining by 13 percent, Boise, Idaho-based Micron increased its market share to 20.7 percent in the second quarter, up from 17 percent in the first quarter, as presented in the table below. In the second quarter, Micron accounted for 80 percent of production from its joint venture with Intel, up from 62 percent in the first quarter. The increase was part of a revised capacity agreement between the two companies. Meanwhile, Micron was able to claim some of the market share ceded by Toshiba. The Japanese maker in the second quarter saw its share decline by 9.5 percentage points sequentially, which occurred after strong growth in the first quarter. Micron in the second quarter remained in third place after No. 1-ranked Samsung Electronics of South Korea, with 42.5 percent; and No. 2 Toshiba, with 24.7 percent. SK Hynix Semiconductor of South Korea sat in fourth place, with 11.8 percent. Like Micron, Samsung benefited from the Toshiba downslide: Samsung gained 5.1 percentage points in market share. Micron also put more distance between itself and SK Hynix, now separated by 8.9 percentage points compared to 5.9 percentage points in the first quarter. Still, Micron’s wins during the period need to be qualified. Despite tremendous growth in its bit shipments, Micron posted a NAND revenue increase that was much smaller. 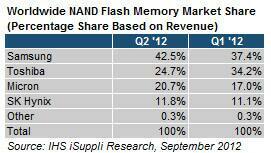 NAND average selling prices in the trade had declined 39 percent in the second quarter compared to a 23 percent drop in the first quarter—mainly because of a shift in product mix toward multilevel cell (MLC) as well as a higher share of bits being shipped into channels other than the embedded market, resulting in lower ASPs. Regardless of the pricing challenges, Micron’s graduation from the market-share teens to the 20’s shows that the company has proven to be a worthy long-term competitor in the NAND flash business. Micron should also be well-positioned for the next wave of demand, expected to come from solid state drives that utilize NAND flash in devices such as the ultrabook, IHS believes.